A bioenergy project in India's south-eastern state of Karnataka is bringing sustainable and carbon-neutral energy to rural villages in a decentralised way. Small gasifiers turn locally produced biomass into wood-gas used to power generators. The electricity is then used to power irrigation equipment, to pump up drinking water, and to light up the village. The project also tackles one of the great problems of the developing world, namely indoor smoke pollution which results from cooking on open fires. According to the World Health Organisation, this 'killer in the kitchen' claims the lives of some 2 million women and children each year. The utilization of producer gas for cooking is far less polluting. The Biomass Energy For Rural India (BERI) initiative, a project of the state government and the United Nations Development Program's Global Environment Facility, has so far tested the small gasifiers in 28 villages in the Tumkur district. Because of its success, BERI is now looking to replicate the model across rural India. Contrary to energy systems based on wind, solar or hydropower, the biomass project delivers affordable electricity and gas on a continuous and reliable basis. The project's success has prompted a similar initiative by the Indian Institute of Science and Cummins India, who aim to scale up production of small gasification plants to bring them to thousands of villages in India (previous post). The BERI project relies on biomass gasification, a process that converts biomass to a combustible gas in a reactor, known as a gasifier, under controlled conditions (schematic, click to enlarge). The combustible gas, known as 'producer gas' or 'wood gas' has a composition of approximately 19 % CO, 10 % CO2, 50% N2, 18% H2 and 3 % CH4. This gas which has a calorific value of 4.5 - 5.0 MJ/cubic metre is then cooled and cleaned prior to combustion in internal combustion engines for power generation purposes. The project demonstrates the technical soundness of 40, 100, 200 and upto 500 KW of gas engine based biomass gasifier systems. Started in 2001, the project has brought light into hundreds of villager's lives. CNN-IBN's Priyanjana Dutta spoke with Laxmi, one of them. Laxmi's house like the whole village is now getting electricity through the biomass based gasifier systems, pumping drinking water, irrigating their lands and using it for cooking purposes. "Earlier we used to use wood that made the whole house smoky and the vessels black. After switching to this gas the vessels are cleaner, the house is not smoky and we are also living happily,” says Laxmi. Climate change today is an inconvenient truth. But BERI thinks that using appropriate bioenergy technology will not only reduce green house gas emissions but also help meet rural energy requirements in a sustainable manner. IBN Live: Farmers use biomass, reduce carbon footprints - September 12, 2007. The Biomass Energy for Rural India project website. The oilseed plant Jatropha curcas is often touted as a biodiesel crop that can be grown on poor soils and requires relatively few inputs. However, analysts warn that this new 'underresearched' biofuel plant currently faces three major problems: yields are unreliable, seeds are toxic, requiring careful handling, and harvesting the nuts is extremely labor intensive. Jatropha remains a wild plant that has not yet undergone the heavy agronomic, biotechnological and commercial research cycles so typical of the major oilseed crops that currently dominate the market. This is changing rapidly as biotech companies are investing in improving the crop (e.g. Bayer CropScience and D1Oils/BP). However, the woody perennial shrub has attracted interest in countries like India and China because it can grow on barren, marginal land and does not intrude on farmland needed to grow food crops. Trial projects have shown that the crop can blend it with local farm practises as it is easy to maintain and requires few upfront costs and fertilizer and water inputs. So far, no major pests or diseases have been identified for Jatropha. However, M. R. Chandran, adviser to the Roundtable on Sustainable Palm Oil, today told an oil and fats conference that the crop is very labour-intensive as each fruit ripens at a different time. It needs to be harvested separately and manually. In an earlier overview of labor inputs needed for different energy systems, Biopact too warned that Jatropha may be too labor intensive and would require very cheap labor to make economic sense. The labor intensity of biofuel production can be a benefit, as it implies the creation of a large number of jobs (see the renewable energy jobs calculator). But in order to be socially acceptable, the production system must also allow an increase in wages over time. Else, a situation akin to plantation slavery emerges in which laborers are kept in perpetual dependence, and the social potential of biofuel production evaporates. In short, a balance must be found between labor intensity and the potential to take laborers along in an upward trend towards increased incomes. 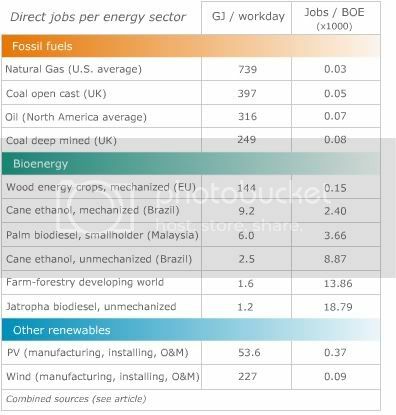 A crop like palm oil, also harvested manually, yields far more oil (energy) per man-hour, but still provides many jobs - a perfect balance (see table, click to enlarge). A second difficulty with Jatropha lies in the fact that its nuts and leaves are toxic. These toxic qualities have been exploited in traditional medicine across the developing world, where concoctions of Jatropha substances are used to heal wounds and treat a great variety of ailments (hence its popular name, the 'purging nut'). The plant can also be found in many West-African villages where it is used as a natural hedge to protect fields from grazing animals, who spontaneously stay away from the poisonous plant. But now that Jatropha production is being scaled up as a biofuel crop, the toxicity of the seeds may become a hazard for the people who have to harvest and process the seeds. Research is needed to understand potential health risks for harvesters and handlers at the processing plants. An engineer specialising in oil and fat processing plants, including for biodiesel production, said special facilities were needed for crushing jatropha nuts as they could produce a toxic vapour. However, the same engineer, who declined to be named, is optimistic and said his company hoped to seal a deal with a private investor to build one of the world's first large-scale jatropha-based biodiesel plants in China's southern province of Yunnan before the end of this year. Finally, so far Jatropha has not enjoyed much professional efforts to improve its productivity. According to analysts, it would take at least five years of intensive breeding and plant improvement before the crop could achieve productivity that would make its cultivation economically viable. The oil yield of current wild species is less than 2 tonnes per hectare with large swings from year to year. Compare this with palm oil, yields of which are around three times as high, with continuous plant improvement research leading to varieties that yield ever more. In short, jatropha still faces major difficulties to make it as an attractive biofuel crop. Some caution is required by potential investors who should not be blinded by the current hype surrounding the plant. On the other hand, most of these problems may be solved over the coming years. There is no reason to assume that the crop would be resistant to yield improvements. According to several sources, classic breeding techniques will possibly result in varieties with twice the productivity of wild plants. Modern biotechnology could develop genetically improved Jatropha, even though this would be controversial. When it comes to the toxic nature of the seeds, several initiatives are already underway to turn this into a benefit: researchers hope to utilize the toxins in pharmaceutical applications (earlier post). Simple technical interventions and the establishment of safety procedures at seed crushing mills and biodiesel plants may offer solutions to the health risks that could emerge in the processing stage. The labor question remains. However, Biopact knows that several organisations are currently researching mechanical harvesting techniques for Jatropha. They basically come down to systems that resemble olive harvesting machines ('tree-shakers'). It remains to be seen whether these techniques become viable, as jatropha continuously yields ripe nuts without there being any clear 'harvest' season. Reuters: Toxic jatropha not magic biofuel crop, experts warn - September 12, 2007. The world’s first biofabric made with completely plant-derived fibers, suitable for use in vehicle interiors, has been developed by Mazda Motor Corporation in collaboration with Teijin Limited and Teijin Fibers Limited. The innovation shows again that the automotive industry is playing a vanguard role in the development of biobased plastics and materials that replace petroleum based products (overview of other examples). This newly developed biofabric does not contain any oil-based materials, yet it possesses the quality and durability required for use in vehicle seat covers. Resistant to abrasion and damage from sunlight, in addition to being flame retardant, the new biofabric meets the highest quality standards. Based on this biotechnology, Mazda will strengthen its future research and development on non-food-based materials in consideration of the impact such technologies have on food supplies. Mazda plans to use the biofabric for the seat covers and door trim in the all-new Premacy Hydrogen RE Hybrid that will be exhibited in October at the Tokyo Motor Show 2007. The all-new Premacy Hydrogen RE Hybrid will also feature a bioplastic, which Mazda developed in 2006, in the vehicle’s instrument panel and other interior fittings. This newly developed biofabric has harnessed the latest technologies to control the entire molecular architecture of raw resins to improve fiber strength until the fabric attained sufficient resistance to abrasion and light damage for practical use in vehicle seat covers. Mazda developed this new biofabric in collaboration with Teijin Limited and Teijin Fibers Limited, companies with R&D and manufacturing sites in the region near Mazda’s headquarters in Hiroshima. Other crucial qualities necessary for the highest performing fabrics, such as fire retardant properties, were achieved through Mazda’s accumulated experience in surface technologies built up through years of cooperation with several local companies. All of Mazda’s biomaterials fall under the “Mazda Biotechmaterial” brand name. Mazda is dedicated to continuing its research and development efforts for these environmentally friendly technologies which will help to realize a sustainable society in the future.